Plants continue to play an important role as the ultimate source of food, nutrients and biologically active molecules for humanity. They are essential for consumption, socio-cultural, nutritional and therapeutic purposes. These nature’s gifts contain several chemical compounds that are beneficial for the healthy metabolic functioning of our body systems. One of such nature’s gifts is the pineapple guava, which is botanically known as Acca sellowiana. Pineapple guava is an evergreen perennial plant that belongs to the myrtle family of Myrtaceae. It is originally from Brazil, Colombia, Paraguay, Argentina and Uruguay before spreading to other parts of the world. Pineapple guava is known by other names such as feijoa or guavasteen and is grown mostly for its fruits and ornamental trees. The tree measures between 1 to 7 metres tall. Although this fruit has similar physical features with the common guava, however, they differ from each other in several ways. While the common guava changes from green to yellowish colour upon maturity, the pineapple guava remains green even on maturity. The tree and seeds of the common guava are also different from that of the pineapple guava. The fruits usually drop from the tree once ripen and they quickly overripe if not consumed immediately upon dropping from the tree. Unripe pineapple guava is bitter with white opaque pulp while the ripe one is sweet with clear gelatinous pulp. The sweet aromatic taste of this fruit is attributed to the presence of ester methyl benzoate found in the fruit. Pineapple guava is a rich source of calcium, dietary fibre, vitamin B1 (thiamine), vitamin B2 (riboflavin), vitamin B3 (niacin), vitamin C, vitamin B5 (pantothenic acid), vitamin B6, folate, vitamin E, vitamin K, iron, carbohydrates, protein, zinc, potassium, manganese and magnesium. Fernandez et al., (2004) reported that the essential oil obtained from the pineapple guava peel contains 67 compounds representing more than 96.4% of the oil. The main components of the oil are 12% β-caryophyllene, 9.6% ledene, 6.3% a-humulene, 4.9% β-elemene and 4.8% 8-cadinene. Pineapple guava is a fruit and can be eaten raw by cutting it in half and scooping out the pulp. The pulp can be squeezed out and eaten fresh. Due to the aromatic taste of this fruit, it can be used for making pineapple guava drinks, cider, compote, smoothie, jam, vodka, feijoa yoghurt, ice cream and wine. The fruit is also used for preparing chutney, salads, soup and stew. Inflammatory Bowel Disease (IBD) refers to two conditions known as ulcerative colitis and Crohn's disease. Ulcerative colitis affects only the large intestine (colon), while Crohn's disease usually affects all the digestive system. Nasef et al., (2015) investigated the ability of a hydrophilic feijoa fraction (F3) to modulate autophagy via TLR2 using IBD cell lines. 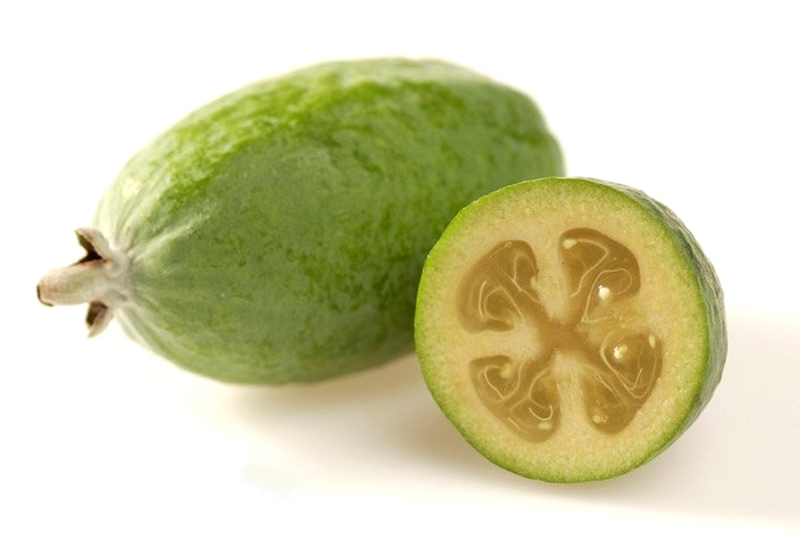 The results showed that feijoa extracts are suitable for managing inflammatory bowel disease in affected patients. 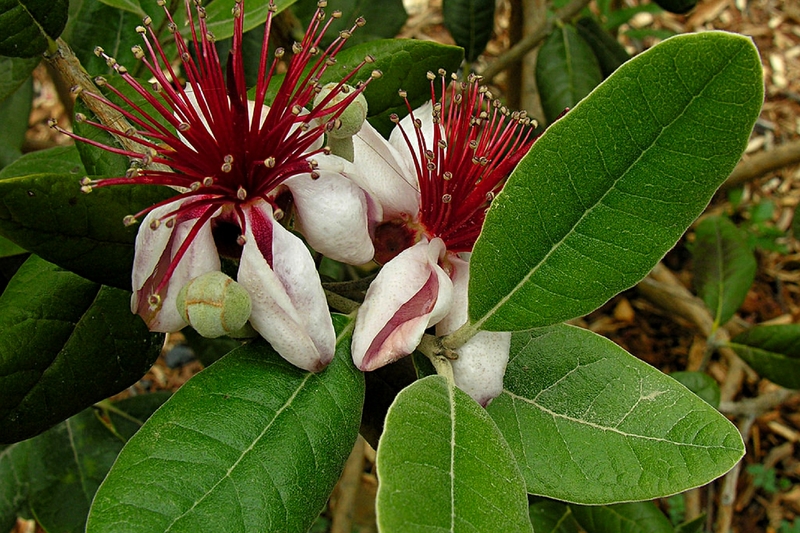 Vuotto et al., (2000) evaluated the antibacterial activities of an aqueous extract from the tropical Feijoa sellowiana Berg. fruit. They tested the extract against Gram-positive and Gram-negative bacteria using a broth dilution test on human whole blood leukocytes, as well as isolated neutrophils based on a chemiluminescence (CL) assay. The experiment showed that the extract inhibited bacterial growth of which Enterobacter aerogenes, Pseudomonas aeruginosa and Enterobacter cloacae were the most sensitive. The results showed that the pineapple guava contains antibacterial properties and as such, its extract can be suitable for tackling bacteria. Monforte et al., (2013) carried out an in vivo study of pineapple guava fruit juice to ascertain its anti-inflammatory activity using carrageenin-induced paw edema test. The experiment also involved an in vitro test to ascertain the effects on superoxide anion release from neutrophils in the human blood. The pineapple guava fruit juice was analysed using the high-performance liquid chromatography method. Chemical compounds such as eriocitrin, quercetin, pyrocatechol, ellagic acid, syringic acid, catechin, rutin, gallic acid and eriodictyol were identified. The results showed a significant anti-inflammatory activity of the fruit juice as well as an inhibiting response on neutrophils basal activity in all experimental conditions. The significant reduction of edema and the inhibition of O2− production during the experiment confirm the anti-inflammatory effect of the pineapple guava fruit juice. Ebrahimzadeh et al., (2008) investigated the antioxidant effect of the pineapple guava leaves and fruit peels using various in-vitro assay systems. All the tested extracts showed a significant level of antioxidant activity and exhibited a similar pattern of activity to Vitamin C at various incubation times (p> 0.05). The extracts showed different levels of antioxidant activity in all the studied models. 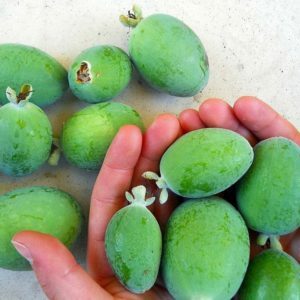 Paola et al., (2007) reported that the Feijoa acetonic extract exhibits anti-cancer activities on solid and haematological cancer cells. It was also observed that the Feijoa extract did not show toxic effects on normal myeloid progenitors, which suggests that the Feijoa extract has a tumor-selective activity. Both the fractionation, purification and analyses of the Feijoa extract showed that flavone is the active component. The results show that the Feijoa apoptotic active principle is the flavone and that the pineapple guava extract contains anti-cancer properties. Feijoa is highly recommended for pregnant women due to the high amount of folate present in the fruit. It is worthy to note that folate is essential for a growing foetus in other to prevent neural tube defects. Pineapple guava fruit is also essential for preventing anaemia during pregnancy as the fruit helps to increase the haemoglobin count. Due to the high dietary fibre present in Acca sellowiana, regular intake of the fruit is highly recommended. Consumption of this fruit facilitates easy food digestion, easy bowel movement and prevents gastrointestinal disorders such as flatulence and constipation. Due to the high amount of antioxidants and vitamin C found in the pineapple guava, daily intake of the fruit is essential for boosting the immunity and for preventing diseases. Acca sellowiana is an excellent constituent of antioxidants, minerals and vitamins such as vitamin C and E that are essential for the well-being of the skin. For your skin exfoliation, the pineapple guava seeds and pulp can be mashed and applied on the skin for 10 to 20 mins before rinsing off with water. Nausea is an uncomfortable condition of the stomach that usually commences before vomiting. Studies reveal that regular consumption of the feijoa fruit helps to prevent nausea and vomiting due to its high constituent of vitamin B6. Pineapple guava contains high dietary fibre that makes one get easily full thereby minimising the chances of constant food intake. This, in turn, helps to prevent excessive calorie intake for a reduced risk of obesity and healthy weight. Pineapple guava contains a low glycemic index and as such helps to regulate the blood sugar levels. The pineapple guava pulp can be used for producing cosmetics such as cream, exfoliant and perfume. Pineapple guava plant and flowers are very colourful thus can be planted around the house for adding beauty and colour to the environment. The fruit and leaves can be fed to animals as feed. DISCLAIMER This post is for enlightenment purposes only and should not be used as a replacement for professional diagnosis and treatments. Remember to always consult your healthcare provider before making any health-related decisions or for counselling, guidance and treatment about a specific medical condition. 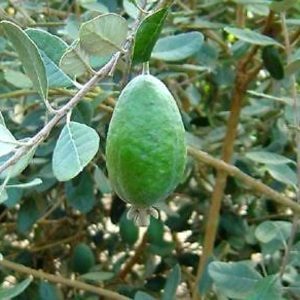 1] Ebrahimzadeh, M. A., Hosseinimehr S. J., Hamidinia A. and Jafari M. (2008), Antioxidant and free radical scavenging activity of feijoa sellowiana fruits peel and leaves, Pharmacologyonline 1: 7-14. 2] Fernandez, X., Loiseau, A. M., Poulain, S. and Monnier, Y. (2004), Chemical Composition of the Essential Oil from Feijoa (Feijoa sellowiana Berg.) Peel, Journal of Essential Oil Research 16(3):274-275. 3] Monforte, M. T., Fimiani, V., Lanuzza, F., Naccari, C., Restuccia, S. and Galati, E. M. (2014), Feijoa sellowiana Berg Fruit Juice: Anti-Inflammatory Effect and Activity on Superoxide Anion Generation, Journal of Medicinal Food, Vol. 17, No. 4: 455-461. 6] Vuotto, M. L., Basile, A., Moscatiello, V., Sole, P. D. et al., (2000), Antimicrobial and antioxidant activities of Feijoa sellowiana fruit, International Journal of Antimicrobial Agents, Volume 13, Issue 3, pp. 197-201.